An obituary written by Sheridan Bruce, daughter. 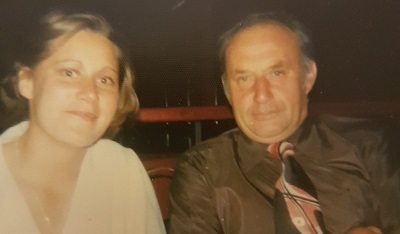 Photo of Don and his mother, my grandmother, Beatrice "Dolly" Bruce, taken mid 1980s. 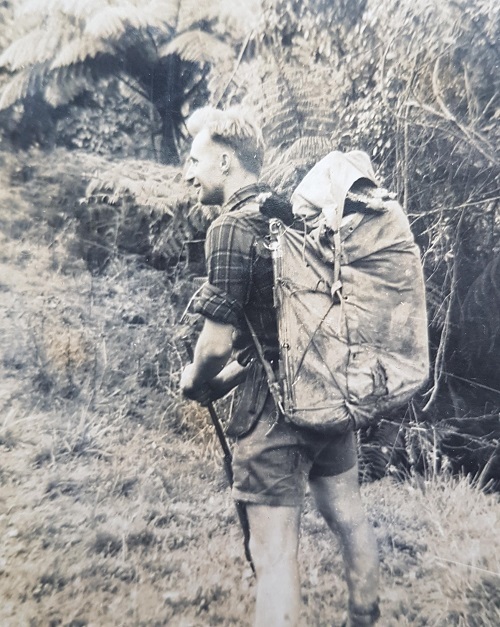 Don's first love was New Zealand's native bush, tramping, hunting and fishing. As a young man, he and his mates went for days, weekends and weeks into the Orongorongo Valley, just north of Wellington, where they built a hideaway affectionately known as Manuka Hut. Manuka Hut and his beloved Orongorongo Valley remained Don's sanctuary and 'first home' for over forty years where he tramped and camped, trapped possums and went shooting and consumed copious amounts of beer and spirits with his bush mates. I'm sure Don would have become a professional 'bushman' had it not been for his passion for reading and education and the influence of a few good women in his life. Don was born in Wellington in 1927 to parents Beatrice Hobman and Alex Bruce, and grew up in Miramar and Kilbirnie. He was the eldest of three brothers, Neil and Robin. Sadly Neil died as a teenage as a result of an accident and possibly because of that, Don was eternally close to his youngest brother Robin, deceased, who we miss very much. Early recollections of Miramar for Don, were of the Great Depression, starving families and great hardship. Don recalled how things changed for the better in 1935 with the first Labour government and perhaps because of this new enthusiasm, the young Don excelled at school. He was a proficient and prolific reader and by age 10, was well versed in the Greek Classics, he collected stamps and was a keen rugby and cricket player. While Wellington's eastern suburbs were Don's stomping ground in his formative years, it soon became apparent, it was New Zealand's waterways, mountains and bush that would capture Don's heart. The aftermath of the second world war interrupted Don's journey into the bush when in 1947 he joined a restoration United Nations unit called J Force and was sent as a corporal to an industrial town called Uke, in Hanshu, Japan. I'm sure the devastation he would have seen convinced him that the solitude of the New Zealand bush was his spiritual home. On his return, he got his reward by being paid by the New Zealand government to 'go 'bush' as a deer culler. Don's early 20s were spent pioneering this country's vast network of huts, tracks and foot bridges as well as pursuing his passion for shooting. On horseback, he and his mates ventured deep into the Central Otago and West Coast backcountry - and Don was in heaven. And I’m sure he thought he was visited by angels when two young women tramping north of Lake Wanaka in the early 1950s knocked on his bush hut door – a most unlikely visitation! Similar to a holiday romance, all things are possible, but in reality angels and bushmen are an unlikely match. Don and one of the angels, Pam, fell in love and shortly afterwards, married. They gave bush life a go for a few years, but a wife, baby Neil and deer culling was just never going to work and Don had to make the ultimate sacrifice. The bush had to go. Wellington Teacher’s College was Don’s next stepping stone and by the time he was 30 years old in 1958, he was a trained primary school teacher and principal of sole charge Mamaku country school, just out of Rotorua, with number two baby – Devon - on the way. Daughter Devon in 1976. A night out with her Dad. Don had a successful career as a teacher and principal and rose through the ranks over the next 28 years. Don’s love of rural life meant that all of his teaching posts with the exception of Waitangarua, were what Don fondly called ‘in the sticks’. From Mamaku the family went to Putara in the Wairarapa where number three child, Sheridan – me - was born. A move to Dalefield outside of Carterton then Urenui in Taranaki four years later saw the Bruce clan living the good life. And to quote Don, Urenui was ’heaven’ and “I didn’t realise it” because he moved the family again, this time to Waharoa in the Waikato, then four years later, to Turangi – in the shadow of Mt Pihanga and surrounds, which become Don’s new stomping or should I say, tramping ground. After Turangi, Don went to Wellington and he took early retirement from Wellington’s Waitangarua Intermediate, in Porirua East, in 1985. It was a foregone conclusion that Don would retire to the bush. With Don and Pam’s marriage having ended ten years earlier Don was fortunate to have met Joy, a fellow teacher at Porirua and the two companions planned their ‘good life retirement’ at the Bay of Many Coves, Marlborough Sounds. They built a beautiful home in the bush overlooking the bay and with access by boat only, their retreat was heaven sent. Don the environmentalist and animal lover took great pride in creating a natural habitat around his home. While he planted a vegetable garden it blended in with the nurtured native flora. And faithful companions Bugsie the fox terrier cross and Traf the cat, while not exactly natives, soon became native and No. 1 family members. Don’s other love while in the Bay was fishing and he would have been seen every day, sitting in his dingy, throwing the line out for cod and spotties. With way too much time on his hands, Don became a prolific letter writer to the editor of the local paper spouting his opinions on anything, from environmental issues, boaties, the ferries, the local council, to wider issues about education. He submitted poetry and philosophical ramblings and is known as quite a character in the Sounds and Picton. So what about Don’s legacy? His sense of humour and eccentric yarns were engaging and his praise of his friends, family, neighbours and acquaintances endearing. He has left a legacy of being a friend and a great guy. Don touched a lot of people. His bush mates and brother Robin were always special. All the children he taught across the country. He was a good and caring teacher. He was respected in the community and gave hours and hours of his time to students and their families which extended beyond the classroom. Don had a lot of friends and talked about them to the end. He was good father. He taught us how to play guitar, fish, hold our own in the big Urenui surf, garden, walk in the bush, hold a rifle and eat eels and wild pig. 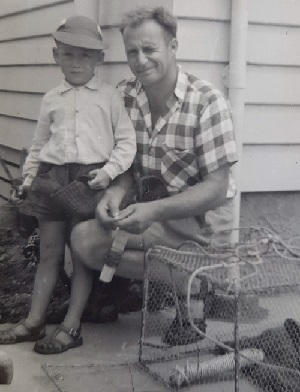 Here he is with his son Neil back in the 50s after fishing off the Evans Bay wharf. Don was a wonderful grandfather, and was especially proud of his grandchildren Jordana, Andrew and Ashley. When they were little, he loved nothing better than to take them fishing, show them how to plant seeds, pick beans and tell them endless stories and tales. And Don was blessed with a great granddaughter Matilda who’s baby photos adorn Don’s home. In the last ten years, Don has spent a quiet life in his lovely home in Waikawa Bay with his friend and carer, Mary Ann who has been devoted to Don’s comfort and well being. What an idyllic life for an old man. Mary Ann to manage him, the garden and home, Stella the dog to walk and Melodie the cat to have purring at his side and dear I say spoil by feeding her none other than veal for every meal. I can’t speak more highly of Mary Ann and the dedication she has shown so our dear Don could spend his latter years in comfort and die with dignity. Don often looked back on his life and said they were ‘good times’. He quietly got on with his life and pretty well achieved his dreams leaving a legacy of a wonderful family, many good friends and a fondness in all our hearts. Don was the father of Neil Robert Bruce, Devon Leslie Bruce and Sheridan Leigh Bruce, grandfather of Jordana Bruce and Andrew and Ashley Eastwood and great grandfather of Matilda Featon. Original generation time 0.9043 seconds. Cache Loaded in: 0.0392 seconds.